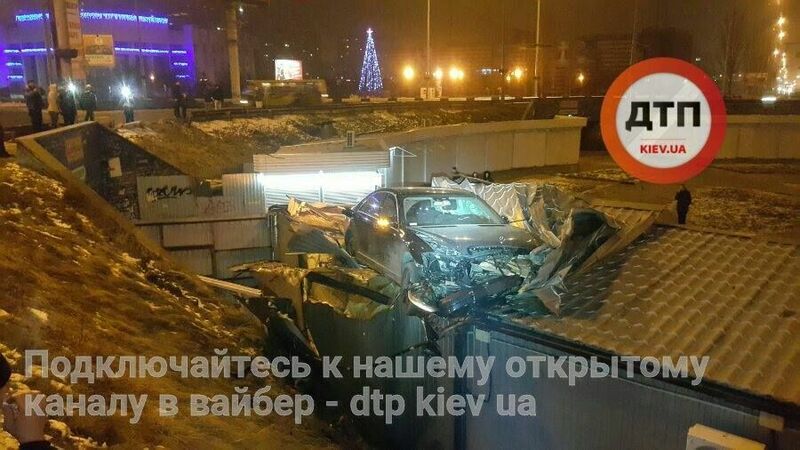 An accident occurred in Kyiv's Troieshchyna district: a Mercedes went off the road, going airborne for some 25 meters and landing on its wheels, the roof of a trade kiosk, dtp.kiev.ua wrote on Facebook. The accident occurred at the crossroads of Maiakovskoho Avenue and Draizera Street. It is reported that the driver of a Mercedes luxury vehicle was trying to flee from scene but was shortly detained by police patrol with the assistance of eye-witnesses. Read alsoSerious power failure reported in Kyiv region over weekend, reasons named"Handcuffed. Refusing to pass DUI test. Denying he was behind the wheel," the report says. It should be noted that road accidents on this roundabout are a regular occurence.